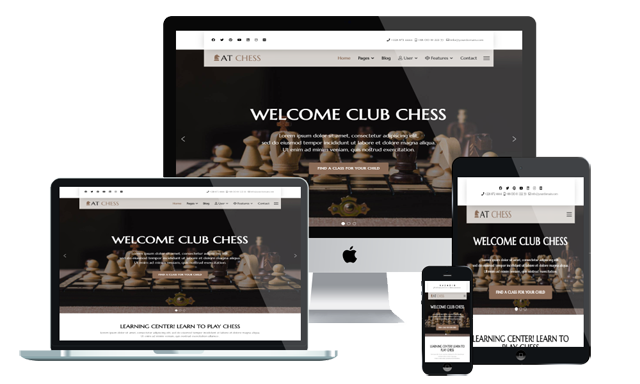 AT Chess is a Responsive VirtueMart Chess Joomla template which helps you to create a wonderful online chess club website with nice look and full of features. Designed to steal viewers’ attentions, this powerful Joomla Chess template is able to compete with any other relating website by attractive appearance and its convenience of giving users’ the best experience. It provides your site with a modern and dynamic layout that will create a really good first impression of visitors. This template has been developed in the latest web technologies, based on powerful framework with completely Bootstrap CSS Framework, Support Font Awesome and K2 extended style, therefore, it is fully customizable without time consuming. Our experienced developers have created with great sense of aesthetics, using eye-catching color and high-quality images. Besides, AT Chess will appear flawlessly on any kind of mobile device, with fully responsive and stylish layout. Virtuemart is also integrated with this template for serving all selling activities on your site. Building a perfect website is no longer a dream with Joomla Chess template!